Baby Chair Gift Basket is a great present to send the newborn girl her own chair to use for years to come filed with bear blanket and sleeper. 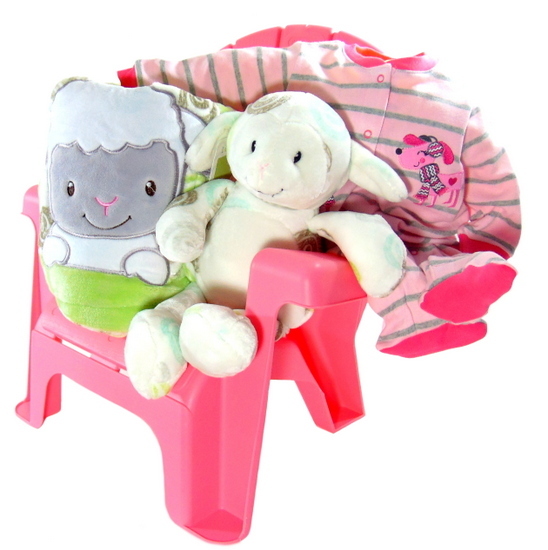 Baby Chair Gift contains: Little Tikes garden chair pink. Pink baby sleeper cotton with booties. Lamb Little Miracle Silky soft reversible blanket. Lamb plush toy. It’s A Girl! Welcome Baby Girl! Congratulations! some of the messages delivered with this gift basket.